The weather has certainly changed, although I do consider November to technically be in autumn things have started to get much wintrier. With ice in the mornings, digging scarves and hats out of the drawers and the fire blazing it’s definitely the time of year for soup. The more filling and comforting the soup the better and my autumn vegetable minestrone is exactly that; a restorative bowl of loveliness. Filled with six different vegetables including beans to bulk it all out it’s simple, speedy, cheap and delicious. Start by getting a large lidded saucepan on a low heat. Add the leek, carrots and garlic along with the oil to the pan and cook on a low-medium heat. Cook with the lid on, stirring from time to time, for 10 minutes. Increase the heat of the pan slightly and add the kale, frozen peas and spinach. Leave for a minute or two to bring the pan back up to temperature before pouring in the hot stock. Bring the pan to the boil then add the orzo. Reduce the heat to simmer and cook for six minutes. Add the beans to the pan along with some salt and pepper and cook for four minutes more. 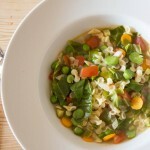 I love that this minestrone is so full of veg and is really substantial and hearty too. The pasta and cannellini beans really fill you up and because it’s not blended each of the vegetables retains its own texture and flavour. This recipe is a great way of using up all those autumn vegetables in the fridge; you could add diced tomato or pepper for a beautiful hit of red too. It freezes really well so it’s ideal for a bit of batch cooking and when it comes to summer, there’s a delicious summer version to try too! P.S. If you haven’t discovered frozen chopped spinach yet it’s a great freezer staple. I chuck a couple of the nuggets in all sorts of food for extra veg; so convenient! This is so perfect for cold rainy weather we have over here. Warming, tasty and healthy! This soup is so packed with flavors! perfect for the season! it’s still not cool enough for soup for me yet (okay, at least in the afternoons. at night, definitely ready for soup! ), but i love how vegetable-centric this sounds! i’ve been making a ton of salads and am feeling a bit bored with all the raw vegetables, so soupy tender ones sound perfect. This looks so good for a cold autumnal night! November here is actually spring, but in my kitchen it’s never too warm for soup and this looks delicious! I’m going to have to give it a go! Love all the veggies you added to your soup, I could eat bowl after bowl of this….. 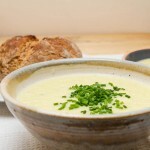 Very wintery here as well, this is a perfect soup to counter the cold blues! Now, all we need in Tucson is some cool weather! what a delicious pot of soup! you’ve put so many good ingredients in there, it would really hit the spot on a chilly day! This is the perfect way to beat the wintery onslaught! I just made a pot of black beans. I need to make soup. This looks wonderfully warming. This looks perfect and I wish I had a bowl of this soup right now, Caroline. Wonderful comfort food!